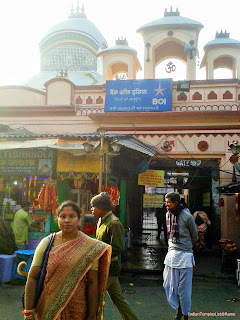 Kalighat Kali Temple is a famous temple for Hindus. It is one of the 51 Shakti Peethas in India located in West Bengal, India. Actually Kalighat was a landing stage called Ghat dedicated to Kali Mata on the banks of river Hooghly (Bhagirathi) situated in the city of Kolkata. The city Kolkata name is said to have been derived from the word Kalighat. Over a period of time, the river was moved away from the temple and now the temple lies on the banks of a small canal namely Adi Ganga, which also connects the Hoogly river (the Ganges). Many people from all parts of India make a visit to Kalighat Kali Mata Temple at once in their life. Irrespective of religion, culture and sectors, the temple is flocked by thousands of pilgrims daily to fulfill their gratitude. 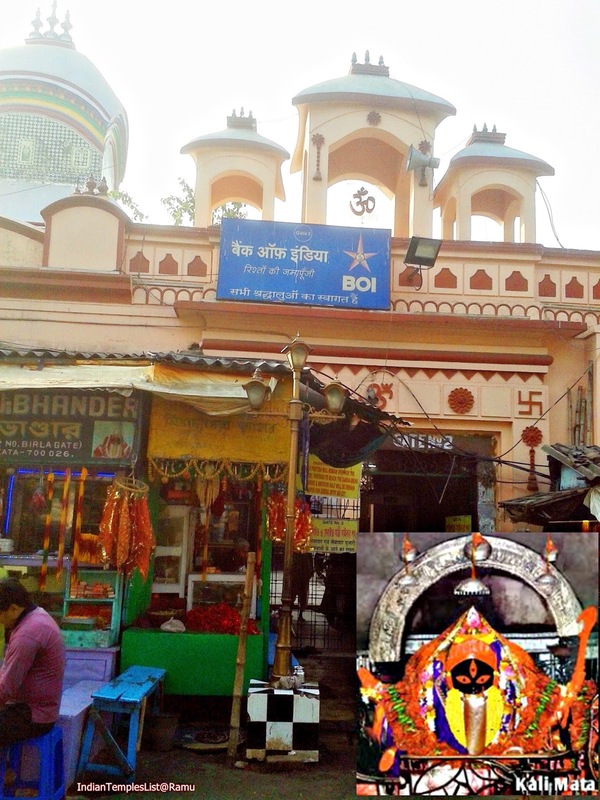 According to history, People believe that Kalighat Kali Mandir is the place where the toes of the right foot of Dakshayani or Sati fell in the course of Shiva's Rudra Tandava. A devotee found a luminant ray of light in the Bhagirathi river bed from a piece of stone carved in the form of a human toe. Also he found a Svayambhu Lingam of Nakuleshwar Bhairav and started worshiping Kaali since 1887. The present form of Kalighat Temple is around 200 years old. At first the temple was a small hut. In 16th Century, the King Manasingha constructed a small temple. In 1809, the Sabarna Roy Chowdhury family of Barisha has build the present Mandir. The present image of Kali Mata in Temple is unique having huge eyes, long protruding tongue made up of gold and 4 hands (made of gold). The temple opens from 8 am to 9 pm. 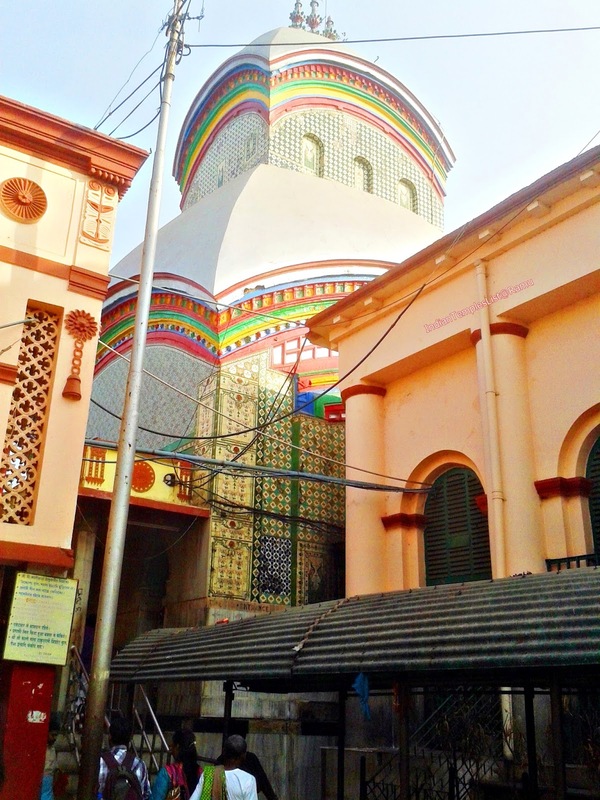 But the ideal time to visit the Kalighat Temple is either in the early morning or in the late afternoon between 3 pm to 5 pm. To avoid rush and waiting in the queue, the best time to visit is early in the morning before 7.30 am. There is no entrance fee for the temple. One caution for the pilgrims is to skip Kalighat during weekends, Tuesdays and holiday periods to avoid huge rush and long waiting periods. People can avail local buses and taxis in Kolkata to reach the Kalighat Temple. Also the nearest Metro station to Kalighat Temple is the Kalighat Metro Station. People can shop for luxuries in nearby local shops at the temple surroundings. As the Kalighat is an ancient temple, it is one of the major tourist places of the Kolkata city. So if you are in Kolkata at any time, make sure to visit the sacred Kalighat Temple of Kolkata without miss. This is a beautiful picture of the article author Nagalakshmi, in-front of the Kalighat Kali Temple. In her view, there are so many guides who misguide you by saying that they will arrange Kali darshan in few minutes with less amount. But, the author suggest not to go with that choice as they demand a lot of money to show the sacred Kali Mata from far away distance in the huge rush. Instead go peacefully in the normal queue and offer your prayers to the Goddesses Kali Mata in short time. Don't forget to drop your valuable thoughts on Kalighat Kali Temple blog post in the comments section. Your suggestions and comments helps us to provide more informative posts and articles in coming days. Very lovely blog post. Kolkata never diminishes with its excitingly colourful festivals, particuarly Durga Puja. Check out all 316 places to visit in Kolkata. 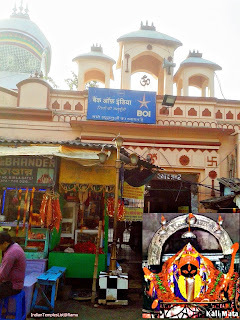 A very informative post about the Kalighat temple in Kolkata. Thanks for sharing the post. The city has evolved with time but still the popular places to visit in Kolkata are doors to the past. Its is a popular city among visitors.